I'm going to put the preview information right at the bottom of this post so I can hide the spoilers from my blog's front page, but I can confirm that it's rather interesting. First of all though, some news! We were promised more special features when the Sengoku Basara: Judge End DVD and Blu-ray releases were announced, and the details have now been confirmed via VAP. 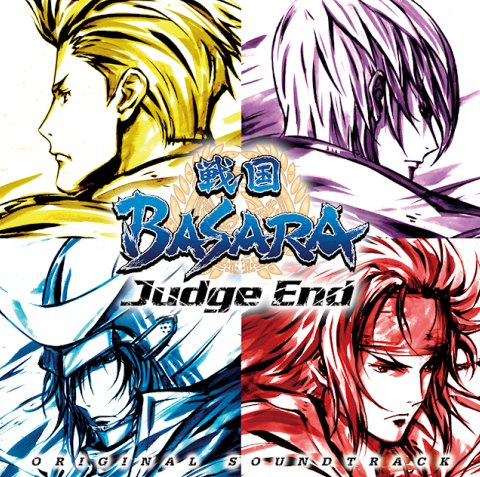 The special audio CD from the first press edition will include the first three episodes of the Hoshi Souichirou and Seki Tomokazu's 'Sengoku Basara: Judge End' Radio show as well as an additional bonus episode featuring seiyuu Nakai Kazuya. There will also be an exclusive keyholder (pictured below) and an audio commentary on the disc itself featuring Nakai Kazuya, Hoshi Souichirou and Kobayashi 'KobaP' Hiroyuki, Capcom's Sengoku Basara series producer. The set will come in an illustrated digipak with a 20-page booklet. The box art for the first volume is below. Later volumes will come with additional keyholders for Sasuke/Yukimura, Ieyasu/Tadatsugu and Mitsunari/Yoshitsugu. Fans who purchase their copies of the sets from certain retailers will receive extra goodies. 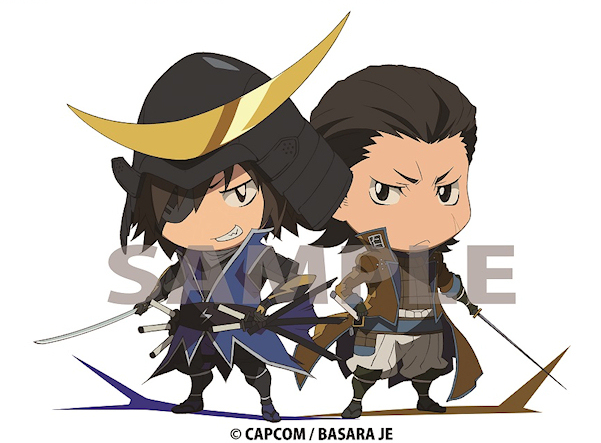 While Animate is giving away a desktop standee of Masamune to fans who buy all four volumes, the other stores only require that you buy the first volume so there may be additional bonuses for subsequent discs. Tsutaya is offering a Mitsunari bromide, Yodobashi Camera is offering a photo print of Ieyasu and Amazon Japan has an oversized Yukimura badge. I'm glad I placed my order with Amazon! It won't surprise anyone to learn that the special guest who will appear on the first press bonus CD in the second volume of Sengoku Basara: Judge End will be Ookawa Tooru (Tokugawa Ieyasu). The staff were accepting submissions for his appearance on the Hoshi Souichirou and Seki Tomokazu's 'Sengoku Basara: Judge End' Radio show earlier this week. I wonder who will feature on the final two volumes now that the four lead characters have been confirmed to appear already? The big Judge End news announcement this afternoon also included the first look at the artwork for the anime's original soundtrack (details here). The illustrations are taken from the series' ending sequence; they look pretty good. An Amazon listing has been spotted for a new book titled Gekijouban Sengoku Basara -The Last Party- Official Illustration Collection II. It's credited to WIT Studio, Production I.G., Capcom and Pony Canyon. Amazon gives the price of the 112-page book as ¥2,160 and the release date as 10th October 2014. It's to contain unreleased artwork from the home video sleeves (including the recent complete box set), CDs jackets and bonus items as well as an annotated screenplay, and storyboards for scenes which didn't end up being used in the final movie. There are only three weeks until its release now but Amazon has finally listed the sixth issue of Sengoku Basara Magazine for preorder. e-Capcom's listing has also formally confirmed some of the details that were printed in last month's Dengeki Maoh magazine: this issue will contain two chapters of Mame Sengoku Basara 4 alongside Yoshihara Motoki's Sengoku Basara 4: Bontenmaru-hen and Tane Jugou's Wan-Nyan Sengoku Basara. 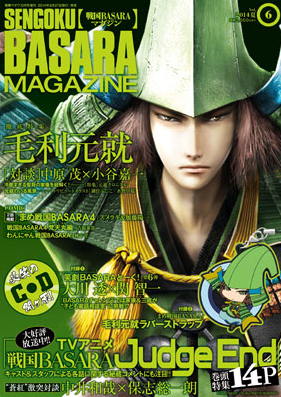 Mouri Motonari will get his own 12-page 'Motonari Chronicle' feature article, of course. His seiyuu Nakahara Shigeru and stage actor Kotani Yoshikazu will team up for the double interview this time, which promises some kind of 'doughnut photograph'(?!). Motonari-inspired illustrations will be provided by Kosumi Fujiko and Mizuno Sao. 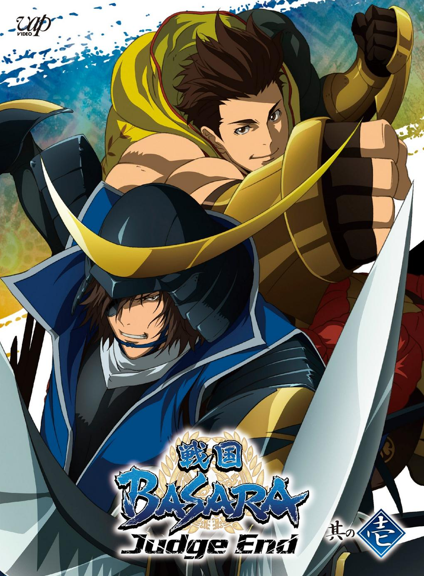 As part of the in-depth Sengoku Basara: Judge End coverage that has been promised, the staff and seiyuu Nakai Kazuya (Date Masamune) and Hoshi Souichirou (Sanada Yukimura) will talk about the anime and creators KobaP and YamamotoD will provide an interview about its climax. The temporary cover artwork is satisfyingly green. The first Gaist Crusher game featured an odd cameo from Date Masamune as 'Jet Masamune', and now it seems that Yukimura will be joining him for the sequel, Gaist Crusher God. The official collaboration page includes a preview video showing the tiger-like 'Nekketsu Yukimura'. 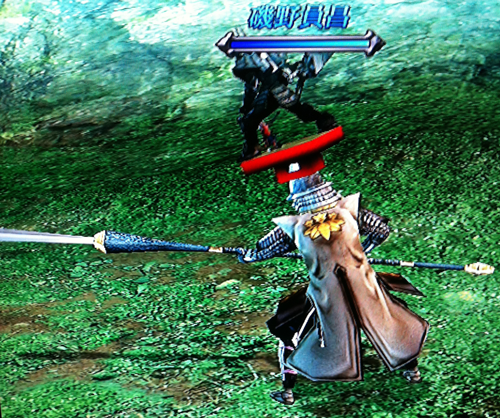 There are also two new Alpha Gaists based on Sengoku Basara 4's DLC costumes. 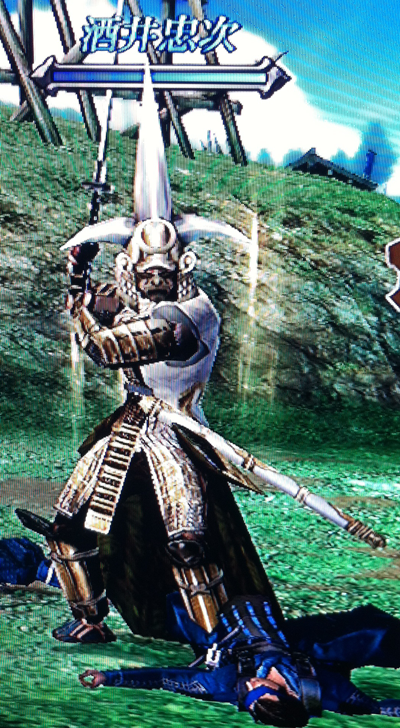 Masamune's hakama outfit provides inspiration for the 'White Dokuganryuu' gear and alternate Alpha Masamune, while Yukimura's 'Souryuu' outfit led to 'Blue Yukimura' gear and 'Alpha Yukimura'. 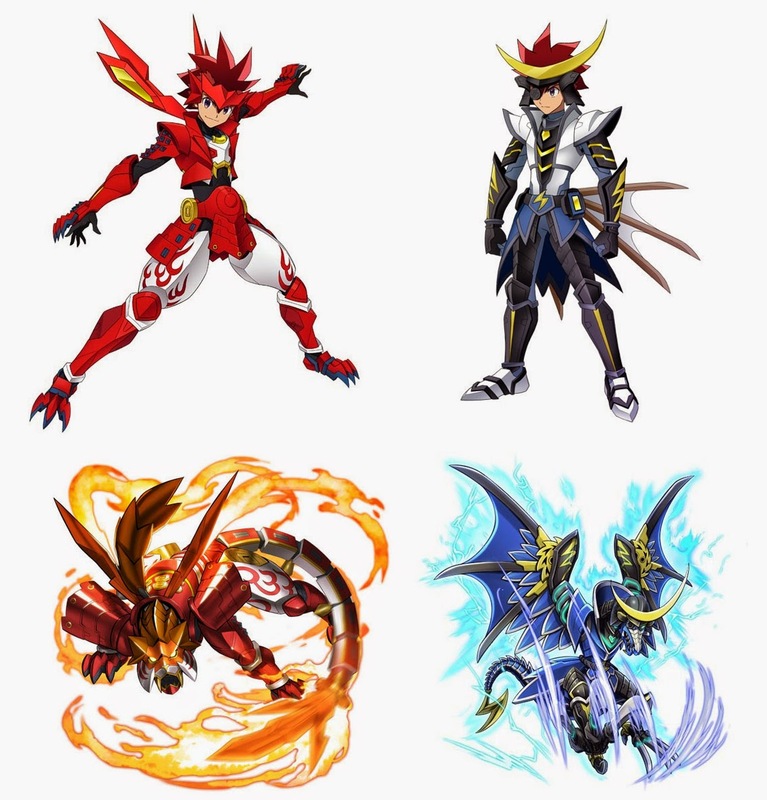 I have never played Gaist Crusher - it's neat that the collaboration is continuing, though. As part of the release activity for the Sengoku Basara 4 Special Package, Capcom has made five of the game's promotional videos available for download on PSN. Thank you to @VegaManX4 for bringing the news to my attention! As well as Animate TV's usual preview gallery for tomorrow's episode and the designs for the new additions to the official character page, this week we've got a lot of new information in the form of three more episode summaries and a surprise new character announcement! The biggest news is that Ueda Youji will be voicing Isono Kazumasa, another anime-only newcomer to the Sengoku Basara cast. While the next episode previews aren't a great deal of help in figuring out how he's going to fit into the plot, his name has been added to the official cast list so he should be appearing soon. Edit 11th August: I just realised, he's probably the angry Oda retainer from episode 5! I went back and checked the credits and there he was. We also now have episode summaries for the next three weeks. I'll hide them after a 'read more' jump to protect people from spoilers. Kojuurou reminds Masamune of the oath he swore at the time of their very first campaign to help him recover from his despair at losing to both Mitsunari and Ieyasu. Meanwhile, Yukimura takes his vow to Sasuke to heart and heads towards Osaka Castle to join up with the Western Army. Chousokabe Motochika goes to Tsuruhime in search of Kuroda Kanbee's key, and, imprisoned underground, Oichi glimpses Ieyasu's blood-stained destiny. With Tokugawa Ieyasu and Ishida Mitsunari raising armies in the East and West, both factions head towards the inevitable final showdown. To learn the truth about the attack on Shikoku and to determine the real reasons behind Ieyasu's rebellion... both Motochika and Keiji travel to Sunpu Castle with these feelings in their respective hearts. Meanwhile, Yukimura gives the order to rescue Oichi, who is imprisoned within Sunpu Castle. And as Tenkai heads towards Sunpu, the form of a mysterious female ninja lurks beside him. 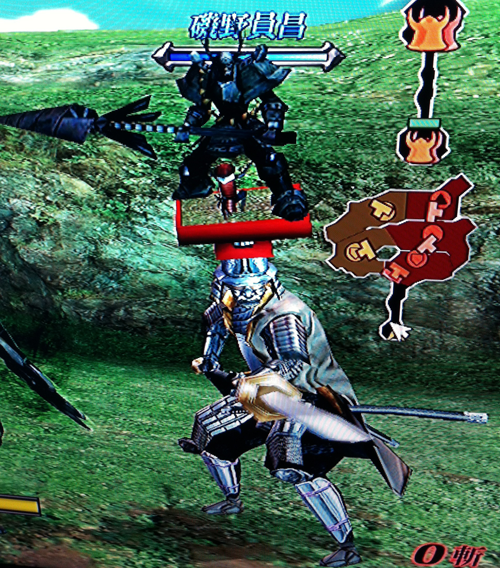 Tokugawa Ieyasu and Ishida Mitsunari vow to do battle in the promised land. Meanwhile, Keiji and Magoichi have learnt that Tenkai's true goal is to revive the Demon King Of The Sixth Heaven: Oda Nobunaga. Oichi and Tenkai head west, consuming the living as they go. Motochika has discovered that Mouri Motonari was the real culprit in the attack on his homeland of Shikoku, and at last, Masamune is reunited with Yukimura in the land of Osaka. Everyone's feelings are directed towards the site of the decisive battle: Sekigahara. I haven't heard of Isono Kazumasa before so I looked him up. In Basara terms he seems to be affiliated with Nobunaga... hmmm. I'm trying to decide whether Kazumasa will appear in some kind of flashback or whether he'll cross paths with Tenkai another way as part of the group of former Oda soldiers - the latter seems most plausible. I'm not too familiar with the original historical figure either, though the last sentence on the English Wikipedia page is intriguing if it's true. She has quite a fan club. Though a lot of people have been speculating that his ties to Sawayama Castle are going to be important, I imagine that the staff would prefer to use him for the Oda storyline so it's not just Tenkai talking to himself the whole time. Oh, for some reason I suddenly wondered whether Kazumasa might be the angry retainer from episode 5 (the guy who was shouting at Ieyasu) and I checked the credits for that episode - it seems that it probably was him! I guess he'll be appearing more often as the face of the old Oda warriors. What do you mean by "fan club"? Well, if Capcom end up making Kazumasa especially fond of Oichi (I think a lot of the remaining Oda retainers in Sengoku Basara 3 fall into this category to some extent already), she's got him, Katsuie and Nagamasa cheering for her - though Nagamasa is presumably long deceased in the timeline of Judge End. She's a popular lady! He's not anime-only, as Basara wiki says, he was in the list of allies for SB3. If only they provided screenshots! I have only seen Sakai's and Shibata's SB3 versions. Mm but he wasn't really a proper character before now with his own seiyuu. 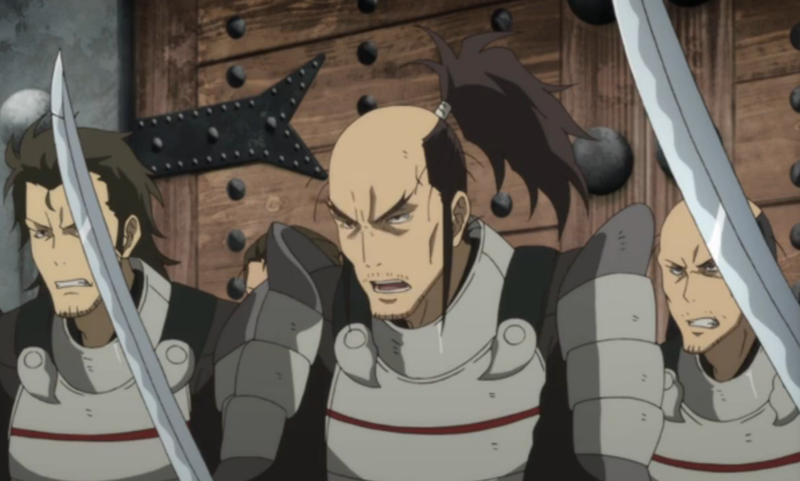 It's funny seeing how the characters went from being relatively generic to getting proper roles in the anime so here's how Isono Kazumasa looked in Sengoku Basara 3 Utage. Apologies for the bad pictures. I don't have any better way of filming my PS3. I guess all of them were in full armor with hidden faces.